KATY, Texas (FOX 26) — Not only is March 20 the first day of the spring season but it is also the first day of the 2019 Pin Oak Charity Horse Show, which ends on April 7. FOX 26 serves as the media partner for the three-week-long multi-breed Pin Oak Charity Horse Show at the Great Southwest Equestrian Center in Katy. The competition runs from Wednesdays until Sundays over the three-week period and generally starts at 8 a.m. and ends at dusk with admission free to the public. Funds are raised through sponsorships, entry fees and social events. The show offers financial donations, outreach and volunteer support for Texas Children’s Hospital. JS Abercrombie’s vision for the show became a reality on May 26, 1945 and it benefited the pediatric hospital starting in 1947 by donating the money to begin the planning and construction of the medical facility. The show has donated more than $6 million and has also supported the Ronald McDonald Family Rooms at Texas Children’s Hospital and Candlelighters Houston for its work in the Texas Children’s Cancer Center. Pin Oak Charity Horse Show was honored to be the first show in the nation designated as a Heritage Competition by the United States Equestrian Federation. 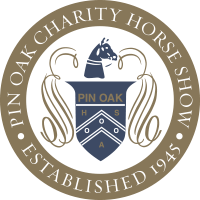 The North American Riders Group selected Pin Oak Charity Horse Show as a Top 25 horse show in North America for three consecutive years.